Atongo Zimba was born in Ghana in 1967. His grandfather taught him how to build and play his koliko, a two-stringed calabash lute, and the first songs he learned were rooted firmly in tradition. He was also exposed to African popular music on the radio, and like many of his contemporaries, he was enthralled by the sounds of Fela Kuti’s afrobeat. Afrobeat inspired him so much he decided to explore the musical idioms of the surrounding regions, and after travelling through several West African countries, his wanderings brought him to Fela Kuti’s Shrine Club in Lagos, Nigeria. Atongo was playing at a nearby market, when some of Fela’s disciples noticed him and brought him to the master himself, and for the next 2 years, he was the opening act at the Shrine club shows. 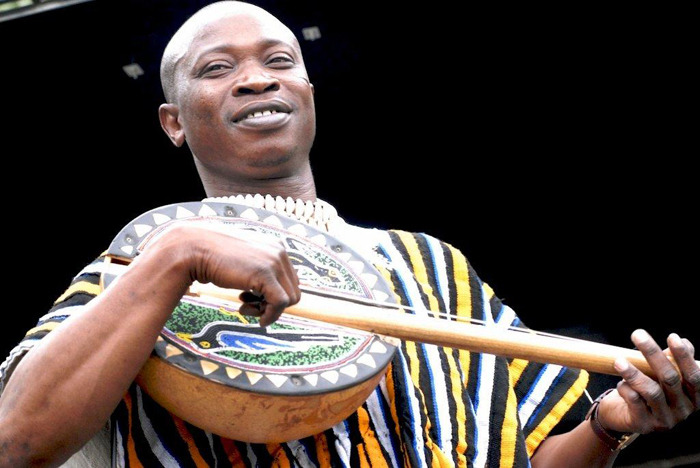 Returning to Ghana, Atongo played at venues all over the capital and opened for many great African musicians including Osibisa, Manu Dibango, Hugh Masekela and Angelique Kidjo.